All you can eat Chili plus Apple Pie and Beverage. Entertainment by Heading Home. Large Silent Auction. Cost is $10 per person. Tickets available from any Breakfast Lion or at door. Event to be held at Balboa Outreach Center. 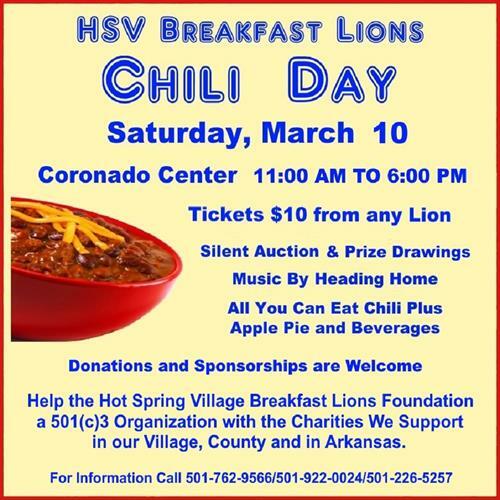 All earnings from the event go to support the charities of the Breakfast Lions as noted on back of the tickets. Please help us support the visually impaired or prevention of visual impairment in Hot Springs Village and surrounding area. Saturday March 9 at 11:00 am to 6:pm. $10 adults, $5 children under 12, Children under 5 free.